Here is some information I put together for a Power Carving Textures demo that I am doing at my local woodturning club. I learned most of the stuff presented here in various wood turning symposiums and classes. Mostly from Al Stirt. First, lets get this out of the way. Hand carving on turnings often does NOT work good because they are round. When hand carving you have to pay attention to and follow the grain. On round turnings the grain often changes directions and thus is hard to follow. Carving across the grain requires a lot of effort and force that is hard to control. Hand carving textures is to time consuming and tedious. Power carving works a lot better for textures. Note: I own a set of good Swiss made Pfeil hand carving tools. If I was purchasing a set today, I would probably go with FlexCut tools. Something like the "FlexCut 21 Piece Starter Set" shown in photo. For around $150 on 1/5/2017. I really like the FlexCut tools. Good tools at a good price. They were not available when I purchased my Pfeil tools a long time ago. Like I said above, hand carving does not work well. Thus I use a power reciprocating carver when I want nice straight or curved lines with nice clean edges. The reciprocating action (quick small back and forth movements like a hammer drill) of a power tool is used to drive a little chisel similar to a hand tool chisel. Controlling a reciprocating tool (starting and stopping the cut) is often easy. They cut across grain a lot easier than a hand tool and create less tear out. I often use a power reciprocating carver with a V-tool to cave lines that define the boundaries of an area that I then fill with a rotary carved texture. The photo shows an Al Stirt style piece I did after taking a class with Al. The curved lines where carved with a FlexCut V-tool in my Ryobi DC500 Detail Carver. The dots were created with a round ball burr in my Dremel tool. FlexCut "Detail Set" Power Gouges – Around $30 on 1/7/2017. Everyone pretty much agrees that the gouges that come with power cavers (Ryobi, Proxxon, etc) are junk. You should replace them with a set of FlexCut gouges designed to fit in a power carver. FlexCut makes a "Detail Set" and a "Roughing Set". I rarely use anything other than the V-tool in the "Detail Set". Thus you probably do not need the "Roughing Set". The FlexCut "Power Gouges" fit directly in Ryobi, Proxxon and Mastercarver handpiece. You may need an adapter for Automach, Wecheer, etc. See FlexCut web site. You should also get a FlexCut RG102 handle so you can use the gouges like a hand tool. Ryobi DC500 Detail Carver – Hands down the best option. It just takes a little bit of forward pressure to start cutting and it does not overheat. Well, like any other tool, it will overheat after a couple of hours of continuous use. DISCONTINUED! They stopped making the Ryobi quite a while ago. I have one and I love it. I just purchased 2 more of them on eBay for around $50 each plus shipping. No one really knows why they discontinued the Ryobi DC500. The only good tool Ryobi ever made? They use to be common on eBay at often outrageous prices given they sold for around $20 when discontinued. They still come up on eBay once and while due to estate sales. Proxxon Power Carver – I see there are now MSG and MOS models of the Proxxon Power Carver. Around $160 on 1/7/2017. The older models were known for overheating and thus not very poplar. The new models are ok? I don’t know if the MSG or MOS model is better. I think one is a little bigger than the other. I would probably get the smaller one to carve textures on my turnings. Smaller is easier to maneuver? The larger one is better for carving big things like duck decoys? The Proxxon is probably your best choice if you can not find a Ryobi DC500 on eBay. Automach Power Carver – The $310 price turns most people off. It has a reputation for overheating but it is not clear what people are using it for when it overheats. It may be a good tool for big stuff. Duck decoys, etc Not worth the price for wood turners? Reciprocating Hand Piece – If you already have a Flex Shaft tool (Mastercarver, Foredom, etc) then you can get a Reciprocating Hand Piece that fits on the flex shaft. Just snap it on to the end of the shaft. The hand piece converts from rotary flex shaft to reciprocating. The Mastercarver, Foredom and WeCheer brands of reciprocating hand pieces all seem to be about the same. But, I don’t really known. I have a Mastercarver one that I don’t use much. It works ok. I just find that dragging around the flex shaft gets in the way. Hard to maneuver. I prefer my Ryobi. Power carving with a rotary burr is fast. You can carve with the grain or across the grain. No problem. The only problem is the rotary burrs often create a lot of tear out. Splinters that stick up where the burr exited the wood. I clean these up with 3M Radial Bristle Discs. I also use the bristle discs to soften the hard edges crated by rotary burrs. The photo shows an Al Stirt style piece I did after taking a class with Al. The lines where created using a Square Cylinder burr in my Dremel tool. The dots were created using a ball burr. The craters were created using the end of a Kutzall cylinder plunged into the wood like a router bit. The craters are a good example of how you have to play around with all the burrs you have. Try them at different angles, etc. Wood Magazine has a good Power Carving Bits summary here. I mostly use Square Cylinder, Round, and a Inverted Taper Cone shapes. Note: The Inverted Taper Cone shape I use is not shown in diagram. Take the Cone Taper and Invert it. This shape is often not part of sets and hard to find. The very common Square Cylinder is almost as good. Caving burrs come in tons of different shapes and sizes. For carving textures I generally like burrs that are roughly 1/4" in diameter, 1/2" tall when applicable, with a 1/8" shank for Dremel. I don’t care if they are steel or carbide. I have mixed feelings about single cut or double cut. I often favor single cut over double. I like my cutters to cut fast. Some times the double cut are to slow. However, double cut is easier to control and creates less tear out. Dremel has a "115 High Speed Cuter" (square cylinder single cut burr) that I DO NOT like because the flutes are to far apart. To course. It makes to much of a mess and is hard to control. Unfortunately, it is commonly available at Home Depot, etc. Avoid it. Other square cylinder single cut burrs with the flutes closer together (the way most manufacturers make them) are ok.
ZJchao 10 Pieces Tungsten Carbide Rotary Burr Set 1/8" Shank – Around $15 on 1/7/2017 on Amazon. Updated 1/25/2017: BEWARE! I just got feedback from a good friend who purchased this set from Amazon. He was not expecting the best quality, but the set he received was terrible! Most of the bits do not run true. They oscillate and vibrate. I should reconsider recommending them. I agree. I should reconsider. But, I don’t known what to do. The set I received runs ok. Updated 2/3/2017: I now own 3 sets of these cutters. All purchased from Amazon. My first set was all ok. The 2nd and 3rd sets have 2-3 burrs in each set that oscillate way to much! Thus I can no longer recommend these burrs! If you want a good set from a trusted retailer, then I suggest you purchase "10-Piece Carbide Burr Set 1/8" Shank 1/4" Head" item # 627001 from www.woodcarverssupply.com. Around $57 on 2/3/2017. However, given the price difference. I personally would, probably just purchase the cheap set and take my chances. The bad burrs in my 2rd and 3rd sets are ones that I don’t care about. Ones, that I personally will never use. Their are lots of sets on Amazon. I chose the set show in the photo because it includes the hard to find Inverted Taper Cone shape I like. It is at the end on the left in photo. See discussion in previous section. I purchased this set from Amazon to confirm it really is what I like. This set is a double cut set. Normally, I would prefer a single cut set, because they cut faster. However this set works good. It cuts fast enough to satisfy me. The cut is also pretty clean. Not a lot of tear out. CMT Orange Bit and Blade Cleanser – I use this to clean my burrs. The orange formula is biodegradable …. I put this stuff in an old pill bottle and soak my burrs in there when not in use. When I want to use one, I take it out and clean it with a small cheap BRASS wire brush from local hardware store. Brass is soft so it does little damage to the sharp edges of burrs. It is one of these things were you are dammed if you do and dammed if you don’t. If you don’t get the crud off the burr it will not cut. If you clean it with a brass brush then you may dull it a little. 3M Radial Bristle Discs – I use these to clean up any tear out splinters left sticking up after power carving. Mcmaster-Carr is the cheapest source for 3" diameter disks. However, Mcmaster does not tell you they are 3M brand on their web site. Trust me they are. I use only the 120 grit 3" disks. 120 grit is white color disks. www.mcmaster.com 6 of # 4494A55 (disks) and 1 of # 4568A22 (arbor) around $23 total on 1/7/2017. Note: This is not the $22 3M arbor. I use a generic $4 arbor. Just cut the end off the arbor with a hack saw if it sticks out to much for your tastes. The disks are only 1/16" thick with a 3/8" hole in center. I stack 6 of the disks on the arbor to create a nice 3/8" wide brush. Like the white one in the photo. Beware! Rio Grande Jewelry Supply, etc sell small 3/4" disks that you can mount in a Dremel tool. The bigger 3" size disks are to big for a Dremel tool. To much mass. Drive them with a hand drill, a flex shaft tool or your variable speed lathe. Dremel Tool – I have an old Dremel 380 tool that I have been using for a long time. It was a fancy kit with variable speed, etc. I have done a lot of power carving with this tool. It is my favorite. Easy to maneuver. Plenty of power. It does not get hot. I almost always use it at full speed (one speed). I recently picked up a new Dremel 200 at Home Depot for $30. On sale for Christmas 2016. Something for my students to use. I have been using it and I like it. This is one that I am now recommending. It is 2 speed (high and low). That is one more speed than I am ever going to need to power carve textures. I only use high speed. Around $50 on 1/17/2017. I only use one speed so I may be able to make due with a Dremel 100 for $30 on 1/17/2017. I don’t have one of these. Thus I don’t know if they are junk. I never use all the junk (I mean stuff) that comes in the kits. Thus I would just purchase the bare bones tool if available. Tip: Attach a 12" long chunk of cheap 1/4" gold chain from local hardware store to center hole in your Dremel wrench to keep it from getting lost. 1/2 HP Mastercarver Bench-Top Basic Set (aka Foredom Flex Shaft Tool) – I like the 1/2 HP Mastercaver Flex Shaft Tool better than the 1/3 HP (or less) Foredom tools. I have the hanging version. If I had to do again I would get the bench version. It now comes with the variable speed controller you need if you want to use 3M Radial Bristle Discs. You can hang up the bench model at any time with a piece of scrap wire. I like this "Basic Set" because it comes with the small drill chuck hand piece (see photo). I have lots of hand pieces. I like the drill chuck one best. You can mount the 1/4 shaft of mandrels for 3M Radial Bristle Discs in this drill chuck. You can also mount any 1/8" shaft (or any other shaft size) style carving burr in this chuck. Some people don’t like this hand piece. They like smaller diameter hand pieces. I like the diameter of the drill chuck handpiece. It feels great in my hands. You can get additional hand pieces or purchase the "Ultra Set". Mastercarver tools are only available from Wood Carvers Supply Inc. Most Foredom and Wecheer hand pieces will fit on the Mastercarver shaft. Also purchase a "Mastercarver Spare Inner Shaft", Item #797020. $11 on 1/7/2017. If you have one of these then you will never break the shaft on your tool and you will never need it. If you don’t have a spare then trouble is just around the bend. Tip: Attach a 12" long chunk of cheap 1/4" gold chain from local hardware store to the drill chuck key to keep it from getting lost. Attach your Dremel chuck key to the other end. Note: I don’t known if I really trust the HP ratings here. Over the years HP has become an almost worthless indicator of performance. Are they ratting the HP under load or no load? Etc, etc. So if a saw a good deal on a Foredom 1/3 HP tool I would go for it rather than pay a high price for 1/2 HP Mastercarver. Beware: Foredom has a confusing mess of tool options and kits (1/3 HP, 1/4 HP, 1/6HP, etc) aimed at different industries (Jewelry, Woodworking, etc). Enkay 115-C Flex Shaft with 1/4 Chuck – If you don’t want to spend a lot of money one of these will do the job. Around $26 on 1/7/2017 from Amazon. Drive it with a power drill or your variable speed lathe. Running your lathe at really high speed 2000+ RPM is a bit unnerving. But is ok for short periods. It works reasonably good with 3M Radial Bristle Discs. But, is a little to slow for good power carving. So one of these plus a $30 Dremel for Power Carving can get the job done. Note: A "Guinevere Flexibleshaft With Chuck" is very similar. But it is $80 on 1/7/2017. Made by King Author Tools available from Amazon. You can mount it in the lathe headsock with a Jacobs Chuck (not a good option), a commercial Collet Chuck with a 1/4" collet or home made Collect Chuck like the one in the photo. Make a collet out of UHMW or hardwood with a 1/4" hole the fits in your 4 Jaw lathe chuck. Any Micromotor Tool – The micromotor tools work great with small power carving burrs. You will QUICKLY burn them out if you try to use them to carve textures with the 1/4" diameter burrs shown above. Use a Dremel or Flex Shaft tool rather than Micromotor tool. Here are the woodcarving suppliers that I use. Wood Carvers Supply, Inc – An old well known company. They pretty much have everything. "Mastercarver" band tools are made by Wood Carvers Supply. I don’t like their current web site. Their print catalog is a lot better. I tend to get things from Wood Carvers Supply because I like their Mastercarver Flex Shaft tool better than less powerful Foredom tools. Treeline USA – Wood Carving Tools – They have most things. A good web site and a very nice print catalog. No "Mastercarver" brand tools. MDI Woodcarvers Supply – Another company that pretty much has everything other than "Mastercarver" band tools. Another web site that I don’t care for and their print catalog is a lot better. Rio Grande Jewelry Supply – They have some carving stuff. When they have something you want like a Foredom tool or carving burrs it is often the lowest price available. They have a very good web site and print catalog. Note: I find the above suppliers usually have better prices than Woodcraft. You can also get things on Amazon. There are good and bad deals on Amazon. Here are some of the tools I use to layout patterns and textures. Polar Graph Paper – I use polar graph paper to layout equal distant divisions (lines) on a round bowl or plate. The Al Stirt way. For 48 divisions, I use: PDF Document Size = 8.5 x 11, Minimum Border = .25 inches, Line Weight Wide = 2 points, Narrow = .75 points, Concentric Circles = 8, Primary Spokes = 12, Primary Labels = degrees, Secondary Spokes = 48, Center Style = Normal, Line Color = Black. For 36 divisions change above to: Secondary Spokes = 36. For 5 divisions change above to: Spokes = 5, Secondary Spokes = 20. The number of "Secondary Spokes" should always be a multiple of the number of "Spokes" for best results. I have found that generating anything other than 8.5" x 11" and then printing it on multiple sheets and gluing it back together is to much trouble. I just print 8.5" x 11" and then glue it on to the center of 1/4" x 15" x 15" plywood. Extend the lines by hand using a ruler and pencil. 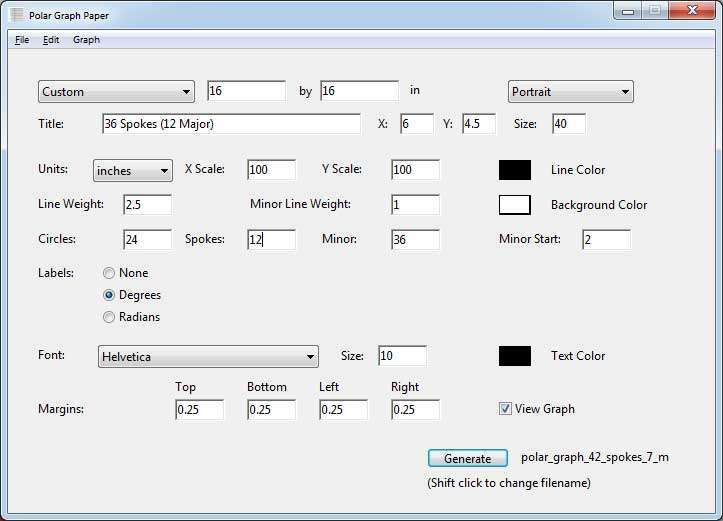 Note: If you want to download a program then try "Graph Paper Maker" by www.blackcatsystems.com. It is virtually the same as the above on line program. Drafting Compass – I like to use a drafting compass to layout equal distant things. The little wheel in the middle allows me to easily adjust it by just a little bit. Around $9 on 1/7/2017 from local art supply store, craft store or Amazon. "Staedtler GeoStudent Compass" on Amazon. Quilters Template Plastic – After I draw a shape that I like (triangle, etc), I use this to cut out a template. I then use the template to transfer shape to multiple places. The Al Stirt way. I also use this to create 1/4″ wide flexible straight edges that I use to layout spirals on hollow forms. Around $4 for 6 sheets on 2/7/2017. Purchase from local fabric store or on Amazon. Derwent Graphic 9B Pencil or a Stabilo All 8046 Black Pencil – When I layout a grid on a piece before I draw on a design, I like to use a #2 grammar school pencil for the grid. Then I draw on the design with a wide soft 9B pencil. The wide line is easy to see and distinguish from the grid. The soft pencil does not leave an impression in the wood. The Stabilo All 8044 Black pencil washes off with water if surface is sealed first with shellac, polly, or lacquer. It will write on anything! Paper, Glass, Plastic, Metal. It makes a nice wide dark line like a 9B pencil. Purchase from local art supply store, craft store, or Amazon. Note: I did not learn this from Al Stirt. Al likes to use a Carpenter Pencil. I don’t like them because they are to hard. When I push to hard they leave an impression in my wood. Derwent Watercolor Sun Yellow Pencil – I use a yellow water color pencil to draw designs on black things. The pencil will wash off with water if surface is sealed first with shellac, polly, or lacquer. Al Stirt taught me to paint a piece black with black acrylic gesso. Sand/buff it with synthetic steel wool. Seal it with lacquer. Then draw a design on it with water color pencil. Carve the design. Then wash off any left over pencil lines with water. Circular T-Square – I made this circular T-square to help me layout patterns. The small arm on the T-square has an angle in it that fits the outside of circles. It aligns the long arm with the center of the work. I think I got this idea from Al Stirt. After I cut a pattern out of “Quilters Template Plastic”, I often tape it to the T-square. This allows me to easily repeat it after indexing with “Polar Graph Paper”. Note the easy to see, dark lines in the photo drawn with a “Stabilo All 8044 Black” pencil. I don’t know of any really good books on Power Carving Textures on turnings. Carving on Turnings by Chris Pye is a good book. However it only has a little bit of stuff on textures. It has good stuff on carving leaves, letters, low relief, spirals, furniture stuff, and other traditional carving stuff. It is mostly (all?) hand carving rather than power carving. Chris Pye is a big name in the wood carving world. This book is worth having. But, not if you only want to learn about power carving textures. Decorating Turned Wood – The Maker’s Eye by Liz & Michael O’Donnell is another good book. However, only the last chapter really, has anything about carving textures. I don’t know of any good DVDs. However Al Stirt is a well known master for power carving textures. You can check out some of his demos on YouTube. In general I DO NOT recommend YouTube. Way to much dangerous stuff is shown on YouTube. Thus I am ONLY recommending the Al Stirt stuff on YouTube. For example "WGNC Demo: Al Stirt carved square platters" on YouTube. Hand Carving, Reciprocating Power Carving, Rotary Power Carving etc are really perfect when texturing on the wood. These are hand tools and automatic power carves which are really fantastic. Even you have also included information on the book which was required. Hey man, really this is mind-blowing. I love it.